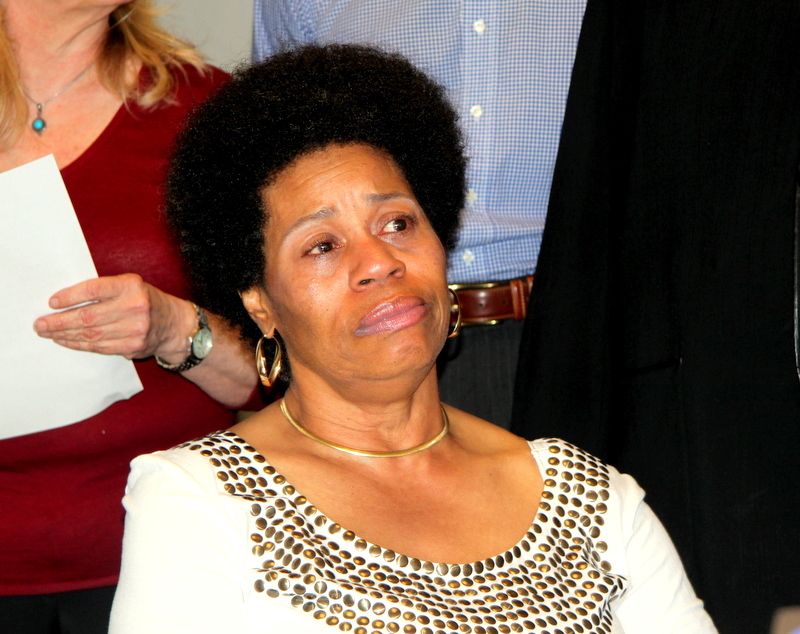 Above: Janice Thompthin, in 2012, describing how a Baltimore policeman shot at her disabled son David Yim through the windshield of a police cruiser. The Board of Estimates will pay three city residents $280,000 to drop their lawsuits against seven police officers involved in alleged assaults, battery or false imprisonment. The cases, placed on the board’s agenda for its Wednesday meeting, add to what the city has already paid to settle nearly a dozen other cases in the last year. The awards amount to more than $900,000 based on The Brew’s review of board records. They come out of a general settlement fund rather than from the police department’s budget. The cases approved by the board constitute only a portion of the total cash doled out yearly to settle allegations of excessive force by police. Only settlements above $25,000 are part of the Board of Estimates approval process. Settlements under that amount are not part of the public record. The latest group of settlements include a $150,000 award to David Yim, a mentally disabled man who was wounded by Officer Fred Murray III in April 2012 after Yim was seen carrying a butcher’s knife on Riggs Avenue near his home in West Baltimore. We wrote about the Yim case in 2012, with remarks by his mother. Murray ordered Yim to drop the knife. When the 39-year-old reportedly failed to do so and “started to advance slowly toward the patrol vehicle,” Murray shot at him through the car’s windshield and struck him in the abdomen. Yim staggered to the porch of a nearly house, dropped his knife and was taken to a hospital for treatment. Yim sought $600,000 in damages. The case was settled earlier this month for $150,000 “because of the factual issues involved and objective injuries suffered by the plaintiff,” according to the law department’s summary. Three officers and one sergeant were named in another 2012 lawsuit settled for $60,000 that will go before the board on Wednesday. Kevin Gray was driving on the 4500 block of Harford Road in November 2012 when he was pulled over by Officers Jai Etwaroo and Ronnie Waters for having a covered license plate. The searches recovered nothing from the plaintiff or his car, but resulted in a lawsuit against the two officers, as well as Sgt. Mark A. Rutkowski and Officer Benjamin L. Frieman, alleging battery, false arrest, false imprisonment and violation of the Maryland Declaration of Rights. In a third case, Duncan Smith accused Officers Jose Boscana and James L. Brooks of roughing him up at the Taste Lounge in far South Baltimore in October 2011. In his lawsuit filed in Baltimore Circuit Court, Smith told a different story, saying he was repeatedly struck in the head by Brooks without provocation and wound up at MedStar Harbor Hospital. The city has agreed to pay Smith $70,000 in return for a dismissal of his lawsuit because of the “conflicting factual issues” and “given the uncertainties and unpredictability of jury verdicts,” according to the law department’s summary.